In the lovely new picture book called Before Morning, by Newbery Honor winner Joyce Sidman, a young girl is wishing for snow. But her wish is not a selfish one. She doesn’t wish for snow so she can huddle under her warm blanket for the rest of the morning. She yearns for so much more. The book opens with a series of stunning “scratch-board” illustrations by Caldecott medalist Beth Krommes. Picture book lovers see a swirling explosion of dark gray clouds hovering over a densely populated city. A few more pages in, little eyes see a bustling city filled to the rim with walking people on busy sidewalks, bumper-to-bumper traffic, chirping birds, determined squirrels, and parks full of children, dogs, toddlers, and old retirees. This city is an overwhelming place. Once the girl arrives home and out of the cold, she should be smiling as she prepares for a cozy meal with her parents. Instead, she sees a pilot’s hat on a chair, and this is the reader’s first clue that something has made her feel sad. The next clue happens in her bedroom, when readers see an Amelia Earhart picture book on her bed, and her mother dressed in a pilot’s uniform. That’s right, the little girl’s mama is a pilot and she’s preparing to go to work. And then comes the child’s prayer for snow. It is a brief prayer, but a powerful one, in which she prays, “Let the air turn to feathers, the earth turn to sugar, and all that is heavy turn light.” If she gets her wish, no planes—not even Mama’s—will be allowed to take off during the storm. This book represents the perfect marriage between text and illustrations. There are scenes of Mama’s suitcase standing at the ready in the hallway, followed by images of magical snowflakes beginning to rain down, flanked by lovely leaves that chase after them in the nighttime breeze. There are geese flying as the snow comes down, traffic snarling, park statues coated with blankets of snow. This is an achingly beautiful book about wishes, warmth, and the magic of snow. The lyrical prose is stunningly brief—and almost grudgingly so; Sidman writes so beautifully, the reader wants to hear what else she has to say. 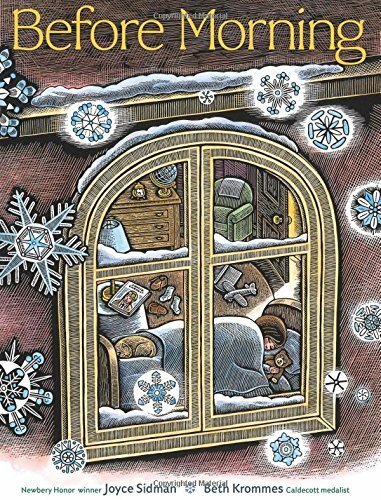 Use this book to bond with young ones, to encourage attention to details, or to recognize and discuss everyday scenarios from the anticipation of being separated from a loved one to looking forward to a much-needed snow day.